Owens Corning Roofing System, A high-performance roof takes more than just shingles. The performance of any roof depends on an entire system of Roofing Shingles Roof Essentials®, accessory products working and performing together, including ventilation, hip and ridge shingles, underlayment, and attic insulation. The Owens Corning Roofing System is a lineup of essential products that can help provide maximum durability for your roof, and the most protection for your home. The system comprises of all the necessary components to achieve a roof that once installed will be low maintenance, watertight, aesthetically pleasing and durable. Hip & Ridge Shingles – are designed to enhance the aesthetic appeal of Shingle roof ridge lines and gives a neat dimensional character. They are manufactured in a range of colours to compliment all colour codes of our Roof Shingle library. VentSure – is a Patented ventilated system which has a unique design and is easily installed between the ridge cap and roof deck. It generates air movement in the attic space balancing both indoor and outdoor temperatures and prevents overbearing heat loads trapped in roof voids. Condensation under the decking is eliminated in winter thus preventing premature ageing of the deck. Shingles – designed with a strong inert bitumen impregnated fiberglass core, imbedded with ceramic granules which are extremely colour fast, weather resistant, maintenance free and present an aesthetically pleasing roof. Weatherlock – a waterproofing underlay which is self adhesive making it easy to apply, while protecting eaves, rakes and valleys from an ingress of moisture. This product is specifically engineered to provide solutions for various waterproofing models. Oriented Strand Board (“OSB”) – decking which is strong, water resistant, durable, while increasing security. Drip Edge – affords a clean visual trim line also protecting the OSB Board by assisting in the flow of water away from the board edge. 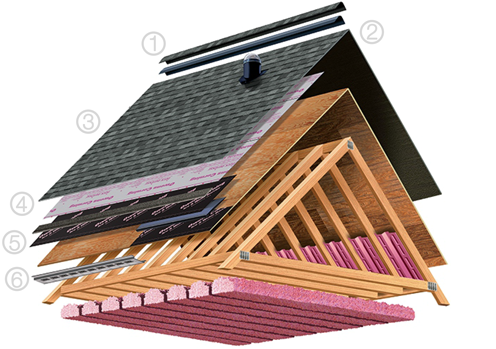 We don’t just supply Shingles – we supply Owens Corning’s “Roofing System” which is quick and easy to install. The Owens Corning Shingle Roofing System has many exclusive characteristics which will benefit Developers, Architects and Contractors within the Commercial, Residential and Industrial development sectors. Added to this Owens Corning Roofing Shingles offer Limited Manufacturer’s Product Warranty. The Owens Corning Shingle Roofing System is competitively priced and will assist in meeting South Africa’s new Legislation with regard to energy saving and the Building Industries demands for lightweight building solutions.